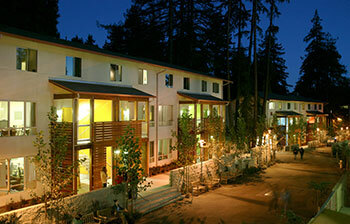 The on campus lodging accommodation will be at Porter College. A discounted lodging package rate has been arranged which includes room and parking. Porter College Apartments are newly remodeled, fully furnished with a living room, kitchen, and shared bathroom. All apartments contain both single and double rooms. Sunday: You may check-in between 4:00 PM and 08:00 PM at the conference check-in table set up at the Porter College circle near the Information Desk. Temporary/short term parking will be available in lot #124 for check-in. When you register to attend UCCSC, you will be asked to select your accommodation as Housed on Campus or Commuter (not housed on campus). Housing options include check-in as early as Saturday July 9th and check-out as late as Wednesday, July 13th. Please note that travel time is approximate, as traffic in Santa Cruz during the summer is unpredictable. Please allow extra time to compensate for congestion. We are not providing shuttle service to and from campus from off-campus hotels. You are responsible for purchasing your own parking permit. No conference rate discounts are available.